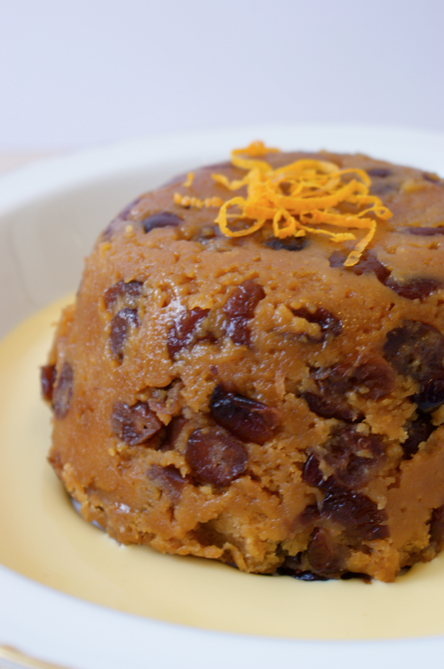 Looking at all the treacle and golden syrup puddings, I decided that it was a shame that honey didn't seem to be used (I'm quite sure that people used to make - and still do make - honey steamed puddings, but I couldn't find a recipe). 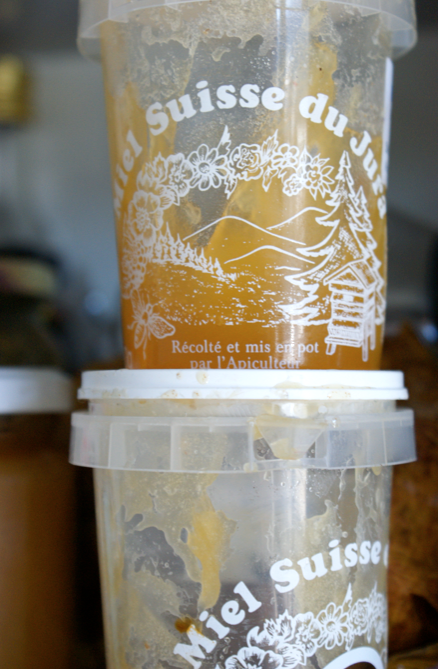 As a result I decided that I should use up one of the little pots of swiss honey we buy each summer at the market. 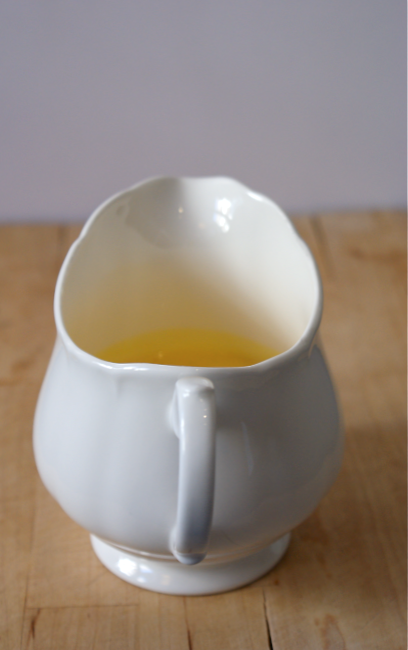 They have an uncanny ability to split slightly and cause a small flood of honey in the cupboard, which meant that the pot of Acacia honey had been sitting in my mum's special hot chocolate mug for several months. To free her mug and to create an excuse to buy some more this summer, I used the remainder of that pot up. We still have several nearly dead ones that we don't have the heart to throw out, as you can see above. 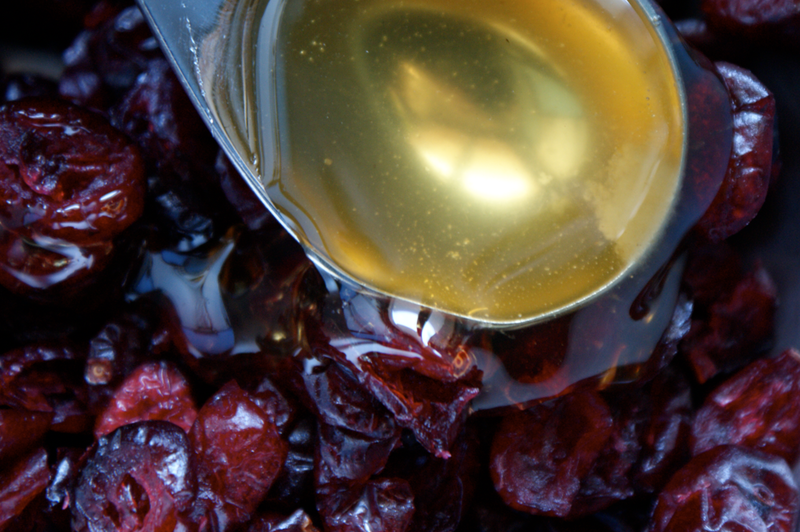 To complement this gorgeous honey flavour, I decided to add soaked dried cranberries for a bit of a sharp kick and some lovely colour. For the first time it seems that they have started stocking dried cranberries in the supermarket at home (YES, cranberry sauce with the turkey at Christmas!) and so I wanted to try baking with them. Before I used them, I soaked them overnight in some of the honey and the juice of an orange. The April 2010 Daring Bakers' challenge was hosted by Esther of The Lilac Kitchen. She challenged everyone to make a traditional British pudding using, if possible, a very traditional British ingredient: suet. 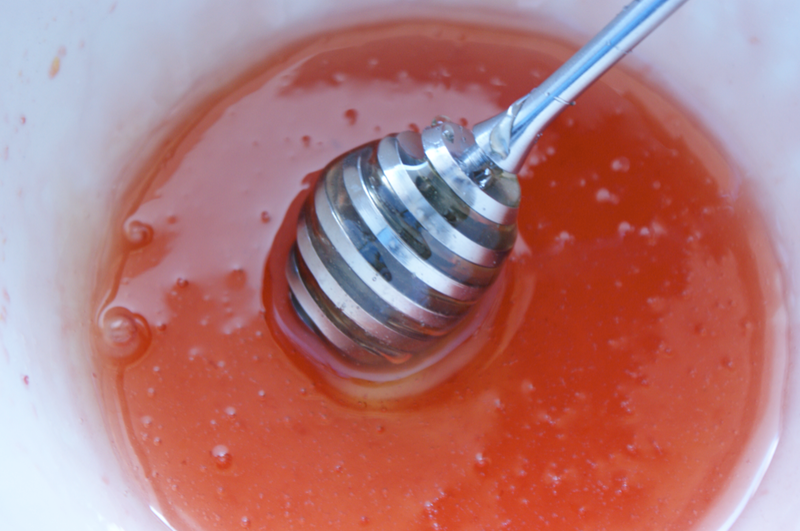 I then added some of the cranberry soaking juice to an additional few tablespoons of honey in the bottom of my pudding bowl. For the pudding itself I made the butter based pudding then added the cranberries and some orange rind and steamed it in Mum's big old le creuset vegetable steamer. I served my pudding with an orange infused custard, which was lovely. I think mine somehow sunk when I had a peek to see if it was done with about 15 minutes to go - it wasn't done and when it was, it was pretty solid instead of spongey. The flavours were nice but I think I should probably try a different recipe another time. With the sauce together it sounds just right! Ooooh this sounds lovely. I had never thought of honey. It makes sense though, doesn't it. Thanks for stopping by my blog. Your pudding looks delicious! I love the flavour combination you came up with. Orange custard sounds like the perfect compliment. That's pretty creative! Very exotic! That custard looks and sounds delicious and the honey pudding is perfection well done on this challenge. Cheers from Audax in Sydney Australia. What a beautiful blog - I'm glad I clicked through and the pudding photos are amazing too, well done. Your pudding looks wonderful. What a challenge. I also chose the sponge pudding version since suet wasn't to be found anywhere. Very tempting looking pudding. Well done for this month challenge. I've never heard of acacia honey before, but it sounds like it must have been a delicious addition! And I love the way you combined the cranberry and orange flavours throughout the pudding. It looks wonderful! So funny - I also made a cranberry orange pudding, but used golden syrup instead of honey. Honey does sound delicious for the pudding--I wonder why there aren't more recipes. I tend to collect jars of honey too, so I may have to try this--it looks beautiful! 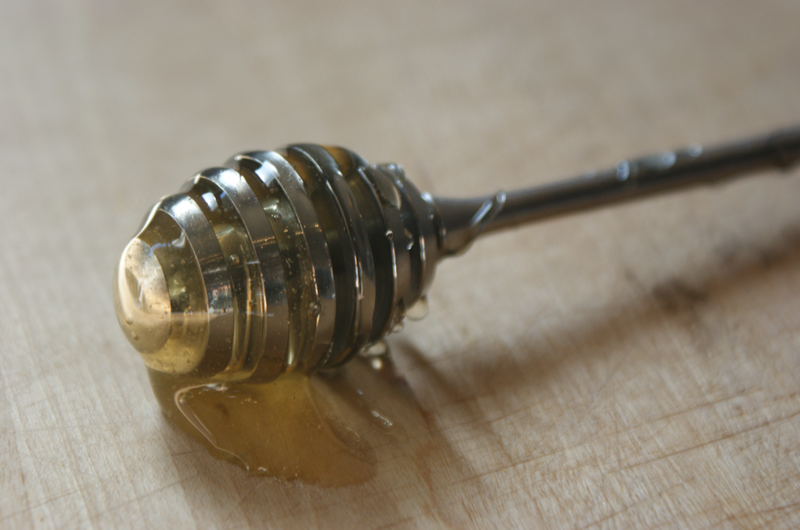 Hm, it is strange that there aren't more honey recipes - it does sound a perfect and natural match. Yours looks fantastic & orange-infused custard sounds wonderful! 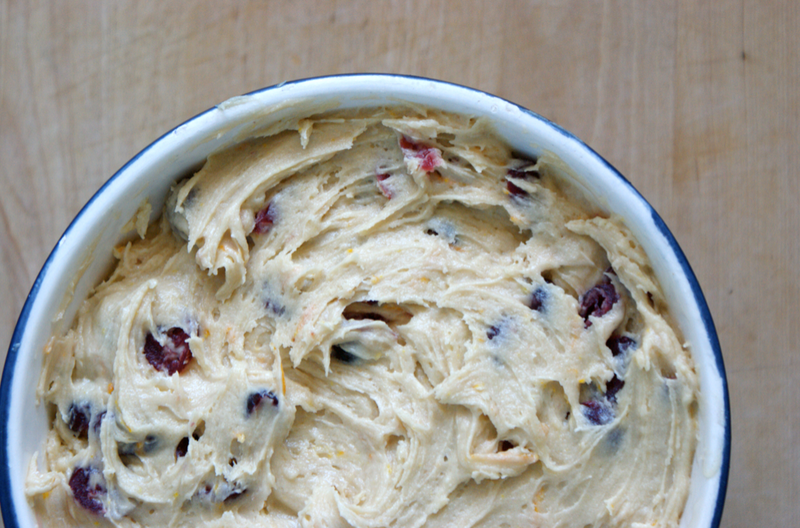 Love the idea of soaking the cranberries in honey and orange. I'm sure it was scrumptious. Very unusual and great sounding flavour combination. Your pud looks good. Un pudding plein de saveurs. Ton idée est fabuleuse! I really love the flavors you chose! Un pudding parfait. I love orange and cranberry together! Your pudding looks beautiful, especially with the custard poured over the top. 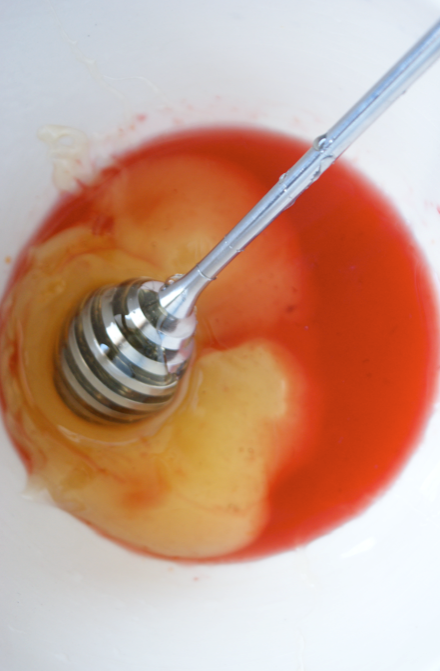 And I love the picture of the honey and cranberries mixing together, it makes a great color. Nice job on the challenge! hHis looks amazing. What a great combo orange and cranberry is. Your are brave making a steamed pudding! I haven't attempted one yet as I fear it will be really stodgy! Beautiful job!! Your steamed pudding looks fantastic, and I bet with that great flavor combination it tasted fantastic, too! !